I happened to stumble upon this when I had just finished reading a chapter of Bakuman a week or so ago. So this is a new piece that started in WSJ this month and had originally ran as a one-shot. The author is Naoshi Komi of “Double Arts” fame, so for all of you obscure manga fans familiar with his work this next piece should be right up your alley. So a romance manga eh Well….. it’s a bit more than that! 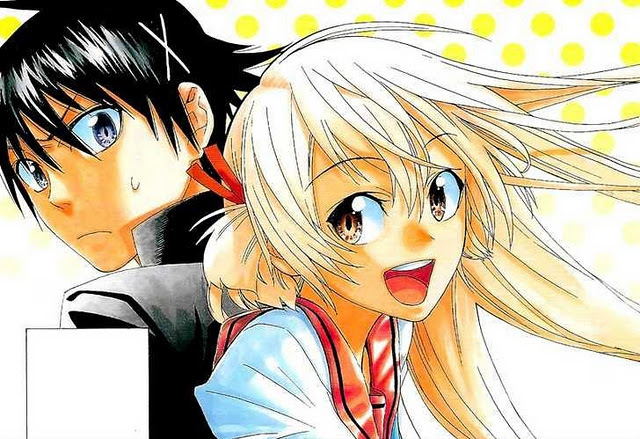 Think Romeo and Juliet, except they don’t love each other and then add gangs, yakuza, your everyday love triangle and a load of humour and you get Nisekoi. So Raku is an ordinary high school student with perfect grades and a weak body, oh and he just happens to be the son of the head of a Yakuza division. Ichijou spends all of his time studying and so doesn’t have time for a girlfriend but he can’t seem to forget a promise he made to a girl from his childhood which involves a locked pendant. On his first day at high school he is unintentionally assaulted by Chitoge – the cute yankee transfer student. Needless to say, the two don’t get along after the rocky start and in fact go on to insult each other throughout their days at school, but something lies in store for both of them; dating! But not voluntarily as their dating is necessary to to stop a war between the Yakuza and the Beehive gang (Chitoge’s fathers gang). This causes a bigger problem for Raku since he believes he knows who the girl from his childhood is. Don’t worry it’s not Chitoge! I like it! Yes it’s a romance manga, but it’s hilarious! If you read it and don’t laugh at any point then you are clearly not a fun person. I like the whole twisted western take on love as well as the Romeo and Juliet sans amour setting which has been incorporated into this manga. Anyone who does know about Komi’s “Double Arts” would tell you the story was good but unfortunately it only started getting a cult following after being cancelled on the 3 tankobon released. This romantic comedy style suits Komi very well and there seems to be a lot of room to make the story progress in an interesting albeit predictable course. My biggest concern; it won’t last long. I don’t say this because I think it won’t be popular but because there is only so much you can extend the story without making it boring, but then again if you look at mangas like Death Note length doesn’t matter as long as it’s interesting! And all I can say is that this type of manga was what WSJ was probably looking for as it seems the abundance of battle and fantasy manga (and I’ll include Beelzebub, Magico) coupled with the fact that they have 2 very successful ‘slice-of-life’ mangas running as well, made this choice seem very refreshing. And I agree! Hopefully I’ll be able to continue reading this manga for at least another 50 chapters.